The Gasteinertal is a valley in the south of Salzburg State, more specifically of the Pongau area. It is well-known or even internationally famous for its spa towns of Bad Gastein and Bad Hofgastein, the former of which was a famous spa resort in the 19th century. 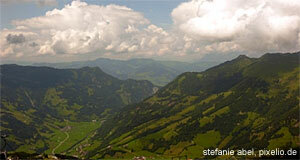 Additionally, there is the municipality of Dorfgastein. Today, the hot springs fuel a vibrant spa holiday scene. Great ski lift facilities sustain a highly developed winter holiday scene; during the (slightly less important) summer season, hiking and other Alpine sports are promoted. The Gasteinertal is also known for golf, the radioactive spa tunnels (no joke) and the local casino. In total, the Gasteinertal is approximately 40 kilometres long; the creek of Gasteiner Ache runs through the valley. In the north, the Gasteinertal merges with the Salzachtal, the main valley that runs across Salzburg; in the south, it can be accessed only via the train through the Tauerntunnel, which enters the mountains in Böckstein (a part of Bad Gastein). The valley is linked to the skiing area of the neighbouring Großarltal Valley. Bad Gastein is historically the main settlement in the Gasteinertal. It was first mentioned in Celtic and Roman times; the systematic utilisation of the valley for agriculture started in the 9th century (relatively late), when Bavarians had moved in to the area. In 1218, the Gasteinertal became property of the Dukes of Bavaria, who sold it to the Prince Archbishop of Salzburg in 1297. Since then, it is part of Salzburg. For the Prince Archbishop, the Gasteinertal was a very important place - because of its gold deposits, which were exploited until well into the 19th century. The hot springs of the Gasteinertal have been used at least since the early 13th century, probably much earlier. For details on the modern spas of the valley, please read our article on "hot springs and spas in Salzburg". Another spa-related attraction are the Heilstollen, old mines with high radon gas concentrations that are supposed to ease pain for some patients with link or other skeletal conditions. Famous historical spa guests include Emperor Friedrich III in the 15th century, the alchemist and doctor Theophrastus Paracelsus in the 16th and various aristocrats since the early 19th century. During a stay of Chancellor Bismarck and Emperor Wilhelm II, a treaty was signed in Bad Gastein and named after the place. In fact, the current face of Bad Gastein′s town centre is still shaped by late 19th century Imperial architecture. This appeals to many international visitors, who are also drawn to the Gasteinertal by the casino which opens here during the main season. Gambling is legal but regulated in Austria.